“Here is Edward Bear, coming downstairs now, bump, bump, bump, on the back of his head. It is, as far as he knows, the only way of coming downstairs, but sometimes he feels that there really is another way, if only he could stop bumping for a moment and think of it. And then he feels that perhaps there isn't.” ‑‑ A. A. Milne. How many Edward Bears are there here I wonder? How many people, like Edward Bear, are dissatisfied with the current situation, wonder if there can’t be something better, and then doubt that there is? Probably quite a few I suspect. Well, the following pages were written with the Edward Bears of healthcare in mind. However, for these pages to be of any benefit, we will have to stop bumping the back of our head for more than just a moment – there is quite a bit to think about; things that we might not have thought about before. If you have just “landed” on this page as the consequence of some frustrated internet search on healthcare and improvement and Lean, or some other such facet, then don’t push the “back button” yet. Hold on for a moment and I will provide some rationale. You may feel uneasy seeing headings above such as “production” and “supply chain” and “projects,” as this indicates some operational bias to this website. But this is exactly as it should be; most of the problems in healthcare are operational. Most of the problems in any modern enterprise of more than one department are operational. Why is this? Well, operations are full of people, and with that there are a few challenges that we need to learn to overcome. We are going to do that by invoking a management philosophy known as Theory of Constraints. If you suffer from improvement fad fatigue, then you have my sympathy (which is of no use to you), and you also have my understanding. We are going to look at why several of the current and past fads have failed to yield the necessary results and also look at the hugely valuable and more fundamental aspects that do yield results. Outside of the Toyota Production System, Theory of Constraints is the only consistent and fundamental approach to process improvement. I am going to make an assumption that many people in healthcare are very busy – after all everyone else is, so I doubt that healthcare is much different, and maybe it is somewhat worse. Therefore, this page will not only serve as an introduction but also as a directory to other parts of the website where there is material that you may need to follow up. As we learn to bump our heads less often, we will find that we have more time. People who have visited this website before will know that I have left healthcare until after production, supply chain, and projects – the three major logistical arms that Theory of Constraints applies to. However, my interest in healthcare predates all of these. It was my interest in service operations that sent me in search of better approaches to the very real chaos that prevails throughout professional consultancies. After all, if seemingly clever professionals such as engineers and scientists are in this state – and a rather permanent state at that – what then of other forms of business? Were we missing something? Could we learn? And I rather picked that of all the service operations, surely modern healthcare services must be the most complex of the lot, surely anything “new” must stand or fall in this environment – hence part of the attraction. I’ve since learnt that nothing is too complex, but most things are simply made way too complicated, complicated beyond belief. The world is not a complicated place, but we certainly force it to behave in a very complicated manner. Much of the problem in modern healthcare – like so much else in the modern world – has to do with the dynamics of our organizations, not the detail, after all we are all expert in the day-to-day detail of our profession or area or what have you. In fact, from the start we have used two terms here from systems thinking; “dynamic complexity,” and “detail complexity.” Somewhere along the way we have asserted that; “dynamic complexity isn’t.” And indeed dynamic complexity isn’t complex at all. It is our psychology and our failure to understand what has gone on in the past 100 years that is the cause of our current situation and the source of the apparent complexity. So, take a step back for a moment and think. Think how little removed we are from the discovery of modern antibiotics, how little removed we are from anesthetic via a chloroform mask, indeed how little removed we are from formerly complicated surgery such as appendectomy that used to require an incision that seemed to extend from the pelvis to the arm. All of this, of course, is detail complexity. There is so much we can do today that was unimaginable 10 or 20 or 30 years ago. Relative expectations right around the world are also so much greater as a consequence. But this is true of any aspect of human endeavor. People are unlikely to forgo their Ipods for 78’s (a 78 was a flat plastic disk with music recorded as analogue grooves that could be played back using a needle – strange but true), so too with healthcare. What is missing is an effective approach to dynamic complexity. Think back again for a minute. Think back again to hospitalization in the time of our parents or our grandparents. Was it different? Of course it was. It was vastly different. It was much simpler. It doesn’t matter what industry you run this test on, it will be the same. It was simpler in that there were less dependencies with which to deal with, and less choice in any case when such a dependency was brought to bear. I guess that we all long for a former simpler experience that we seem to have lost, but at the same time we don’t want to forgo the improved detail that we have gained since. However this isn’t a win-lose situation. It is win-win, if only we are willing to learn how. And in order to be willing to learn how, we must be willing to suspend some of the things that we have learnt in the past and still hold to be true. There is a fundamental paradox in that what we have learnt through personal experience is exactly what we don’t need if we are to successfully operate a modern healthcare system. There’s that damn word “system” again, it will undoubtedly keep popping up. The peculiarities of the dynamic complexity systems that we are going to look at is that they are composed of tasks or steps or stages that are strongly linear, serial, and dependent. Many stages have a specialist staff that only do one or two particular things (and very well at that). The trouble is that all of “this” has only happened in the last 100 years or so, barely a couple of generations. We don’t teach people how to manage this situation because we fail to recognize that it is different. We “know” how to manage each task or step or stage – or so we think, if they existed in isolation – and we extrapolate that out to the belief that competent management of the whole system is simply the sum of the competent management of each and every task along the way. In these webpages we have consistently called this the Reductionist/local optima approach. But there is another approach that we must use, the Systemic/global optimum approach. You see, healthcare from a dynamical point of view is like a chain, and a chain as we know is only as strong as its weakest link. We must seek out the dynamical weakest link and strengthen it and protect it, and once strengthened and protected, we must search for the next, and so forth, in a process of on-going and continual improvement. It is not just the detail of healthcare solutions that must improve, it is the dynamics of the delivery that must improve as well – and we are starting from behind. We’ve been here before, many times before, since modern hospitalization first occurred; scratch the surface and many things that we now take for granted have their origins in Scientific Management from the early 1900’s. At the moment Lean is the lead mechanism for healthcare process improvement. That healthcare professionals are receptive to Lean methodologies indicates only too well the underlying desire to do better with the limited resources that we currently do have. After all, everybody wants to do their best – right? But Lean is an amalgam of a number of previous attempts at system improvement. These older strands weave in and out of the current approach, however, one or two important strands that ought to be in the mix have been dropped out, and one or two that ought not to be in the mix have been added in. Let’s address these briefly. Lean is essentially an explicit Western academic interpretation of a tacit Eastern industrial reality that we know today as the Toyota Production System. The Toyota Production System isn’t a recent development, the philosophical roots go back to the late 1880’s within the Toyoda family, the intent to manufacture cars extends back to 1911, and the actuality of beginning to build cars dates from the early 1930’s (1). § Autonomation (automation with a human touch). These come from the silk spinning & weaving origins of the company and the Toyoda family. Integral within this is a focus on the absolute minimization of waste. This major thread, the absolute minimization of waste comes via the contemporaneous work of Frederick Taylor and Frank and Lillian Gilbreth in North America in the late 1890’s and early 1900’s (2). Lillian Gilbreth visited Japan on a number of occasions and Taylor’s work was translated and vigorously advocated by Japanese nationals at the time. Not only has the elimination of waste had a pedigree extending back to North American industrialization in the 1900’s, it has also reappeared under the auspices of; Kaizen, Total Quality Management, and World Class Manufacturing – each of these being an attempt to describe key Japanese industrial expertise. As I said, we have been here many times before. A strand that has been left out of the Lean mix is the impact that W. Edwards Deming’s methods had on Toyota from 1960 onwards, and many other major Japanese industries since 1950. Deming’s work is based upon the foundations established by Walter Shewhart at Bell Labs in the mid-1920’s (3). These days the work of Deming is pretty much bastardized under the banner of Six Sigma and we are all the poorer for it. And this is why people have to talk about Lean and Six Sigma as a pair within the same breath and within the same sentence. These three approaches; the Toyoda’s, Taylor, and Deming/Shewhart were concomitant with the development of modern industrialization and the needs that arose out of that. By the mid-1920’s we had the essentials of what we require except for one thing – an understanding that we have only had since the mid-1980’s. We will come back to that soon enough. Another strand that is left out of the Lean mix is the logistical backbone of Just-In-Time, either the use of Kanban logistics or Tact time. The reason for this is two-fold. Firstly Kanban and Tact time really are best suited for repetitive manufacturing. There are nevertheless places in healthcare where they could be used – drug and consumable resupply for instance – but generally they are not. This is because of the second reason, the West’s predilection for data (detail complexity) and computer information systems, especially those known as material resource planning (MRP II) or enterprise resource planning (ERP). It seems to be poorly understood is that Kanban logistics has the essential function of stopping the waste of over-production. More critically, Kanban is the focusing mechanism or driver for process improvement within the Toyota Production System. A common enough analogy is a boat floating over hidden rocks. The rocks (our problems) are hidden in a sea of work-in-process. In healthcare we call these queues, and they contain people called patients. The Kanban system functions by reducing the sea of work-in-process step-by-step until it uncovers a new problem. The new problem is then addressed using various techniques and improvements are made until there is no longer a problem. The cycle then continues. Without a focusing system for the whole process we are left with only local initiatives, and that unfortunately is how Lean in healthcare functions at the present. What then of the threads that have been added to Lean that ought not to have been? Well, the predominant one is value stream mapping. The Toyota Production System is recognized as a new sociotechnical system (4); it is characterized by people who work within the system all of their working lives, it is characterized by people who move around within the system, 6 months here, 2 years there, learning how the process works. In the West where, to paraphrase Deming, we don’t have such constancy of purpose, people don’t actual know the entire stream of their process, and if we bring in consultants, which isn’t such an unusual occurrence, the matter is made even worse. We can’t blame our people, after all our whole management system is built around local efficiency and departmental optimization, and if that wasn’t enough, our career progression is determined by individual achievement, not group achievement. That, however, isn’t a good reason to adopt value stream mapping. With focus, you can bring about real improvement in the time that most people are still trying to work out how to map their value stream. In the section called “& More ...” we discussed in some detail; Deming, Taylor, and Toyota – in fact a page for each. The point of this was to illustrate how they have each been systematically mis-understood. They have been systematically mis-understood because we operate under a paradox or a “cloud” whereby our personal experience as individuals stops us from learning from our everyday experience in industry. We called this the fundamental cloud. You can find two files in the PowerPoint section that address this in general terms. Lean and the predecessors such as Kaizen, Total Quality Management, and World Class Manufacturing will not help us because they are bereft of context. And the context must be systemic. The original work of Deming, Taylor, and Toyota had the context embedded within it. Descriptions of the derivatives lack this aspect. They are, as Taylor described it in 1911, mechanisms without the essence. You can see the problem isn’t a new one. Well, it is a both a curious and fortunate thing that healthcare professionals are actually exposed to this context, the essence, within their professional lives. Healthcare professionals do understand systems – albeit a plethora of sub-systems – in the form of the human body. And each of these systems has some rate limiting factor, a weakest link. So too with our healthcare processes. Indeed the healthcare process is best viewed as a patient. Healthcare professionals know about rate limiting steps. Rate limiting steps are of course a dynamic entity, however, we are going to take a step back for a moment and use a simple static analogy – a chain. The weakest link in our static chain is analogous to the rate limiting step in a dynamic system. A static chain should not be our preferred analogy, but let’s continue to work with it for a short while. It has its advantages – for instance, you can go and cut a plastic chain and use it as a real-life analogy. What about this chain then? Where is the weakest link? It clearly has to have one. If we were to pull the chain it would eventually break at one of the links, but which one? This is often very much closer to peoples’ real experience. The analogy makes sense but the location of the weakest link is no longer so clear – or it is clear in so much as everyone’s own department is “probably” the weakest link. But that won’t do. There is only one. This brings us to the next point. 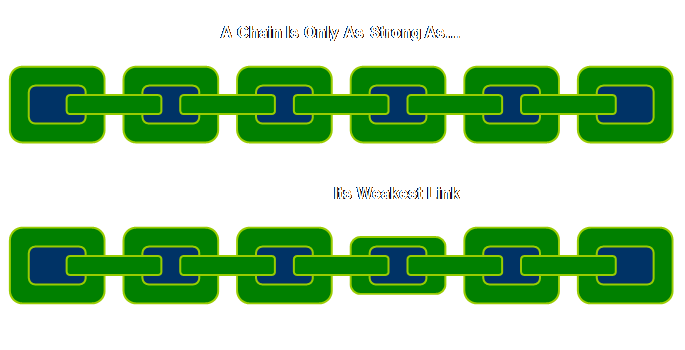 Unfortunately in Western management we break the system down into pieces and seek overall efficiency and optimization from every link – that’s why it feels as though “our” link is always the weakest. If we don’t believe that, then we just need to go and look at the KPI’s that people are expected to perform to, or go and look at the management accounting figures – the subdivision and allocation of costs across the system as though each link is independent. Either of these approaches ignores the serial dependency, in fact interdependency, between the various links. The key to this quest is the identification of the weakest link, the rate limiting step in our process. Once we know where this is, it then offers us huge leveragability. But let’s now change our analogy; change it away from a physical chain to one of a “group of groups” of people. Let’s have a look. Firstly, here is a group of people. They might be a department or a team, we don’t need to know exactly what, they are after all just an analogy. And here we have a group of groups of people. Well that’s nice. And in our local efficiency/departmentalize view of the world we might accept this diagram at face value. 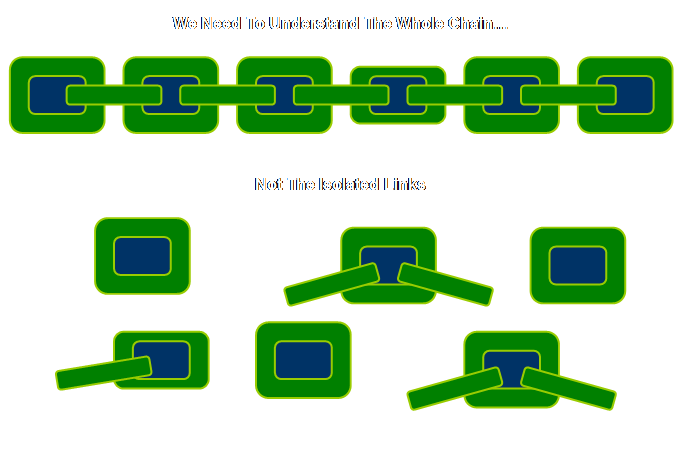 But the chain analogy begs the question, what are the links? There are links, let’s have a look.